The General Plan is required by State law and was last updated 15 years ago. The future envisioned by that Plan is already history—it’s time to plan ahead! 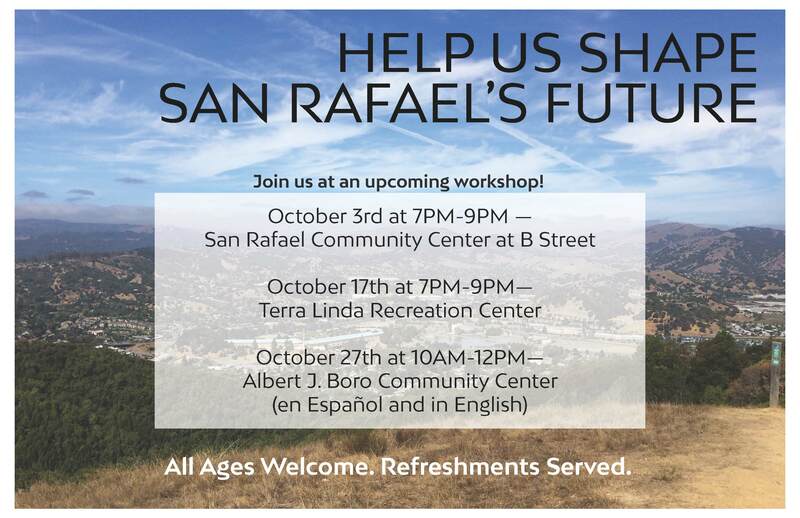 San Rafael is now thinking about the year 2040—and we need your help! Join us for the first of three General Plan 2040 community workshops in October to discuss how the City will plan for housing, transportation, land use, natural disaster resilience, sustainability and more! Refreshments will be served, and all ages are welcome. We’ll have interactive activities and live electronic polling so participants can see results in real time. Input gathered from meetings will be incorporated into a new General Plan for the City. Can’t make a meeting but want your voice heard? Visit our interactive public input website: www.cityofsanrafael.org/2040. For more information, visit the General Plan 2040 website.